McDonald’s may have developed all-day breakfast technology and Wendy’s may have convinced the American public that chicken nuggets can be a side, but only Burger King has really been focusing on pushing the art of the hamburger to new levels. Last year, it devastated our bowels with the terrifying Halloween Whopper and its spooktacular black bun, then earlier this month it introduced The Burger King Classic Grilled Dog, a cylindrical package of some meat-like product that can be dipped in water and swallowed whole or chewed up into little bits like real food. 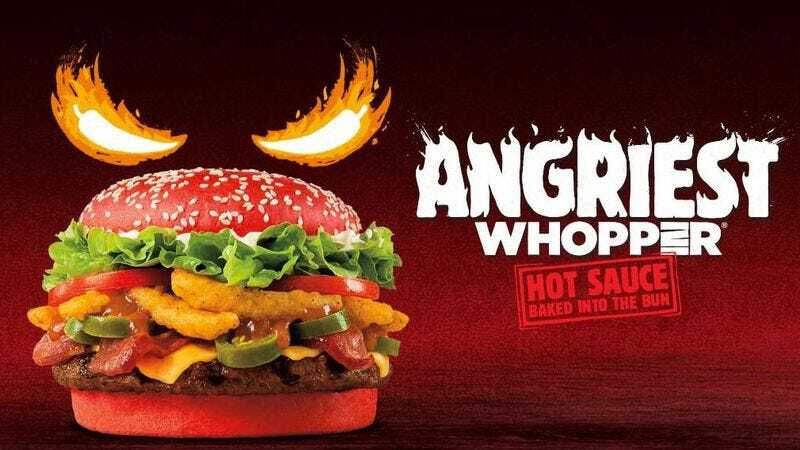 Now, Burger King has topped all of that with a new Whopper that’s literally red-hot…or at least hot and literally red, but that’s not as snappy. The food thing is called The Angriest Whopper, and according to the fast-food journalists at Time, it includes “flame-grilled beef, piled high with thick-cut bacon, American cheese, iceberg lettuce, tomatoes, crispy onion petals, jalapeños, creamy mayonnaise,” and something called “spicy angry sauce” (which is probably the literal translation of something in Japanese). All of that is safely tucked inside a “fiery red bun that has hot sauce baked in,” just to make it all a bit angrier. In other words, then, it’s a normal burger with jalapeños, Red Kryptonite-infused sauce that makes you angry, and some hot bread. Plus, Time doesn’t go into this, but it’ll probably make your poop a weird color. Who doesn’t love hot bread and poop that is a weird color?